If you want to have some genuine Door County fun, see Door County from the water – with a knowledgeable crew aboard The Shoreline Charters / Scenic Cruises boat. And the fleet is now bigger and better! Shoreline Charters/Scenic Cruises offers narrated daily sightseeing cruises from two locations and has three different size and style boats to accommodate individuals, families, or groups. This is a fun adventure – so plan on taking a scenic cruise now! Read on (and save money)! 2019 will be their 25th anniversary! They keep doing things right! Captain Jim (who owns the business) tells us that Shoreline covers 16 to 18 miles of coastline per cruise, and stops at all the scenic areas so people can get the photos they want. Jims says, "we get our passengers up right next to the cliffs, caves waterfront estates, lighthouses etc. - and in fact with our motorized tour boats can guarantee it." Their newest addition to the fleet is a boat named “Water Taxi" which departs from Sister Bay Village Marina, with Captain Geoff. The Water Taxi was an actual water taxi in the Chicago River for many years. Ironically the company who owned it in Chicago was named Shoreline Sightseeing (no relation). Captain Jim who owns the boat now tells us he has taken the Shoreline Sightseeing Cruises in Chicago and highly recommends them to anyone visiting the Chicago area. It is a former Navy Launch or Liberty Boat and is a Coast Guard certified vessel for 42 passengers. Shoreline Charters/Scenic Cruises is the oldest sightseeing cruise company in Door County offering their narrated scenic cruises since 1994. We just went cruising on it and it is a fun boat! In 2017, the Sister Bay operation will moved to Baileys Harbor. From Baileys Harbor, Capt. Geoff is running the Water Taxi there and taking passengers to Cana Island Lighthouse, The Bird Cage Lighthouse (Old Baileys Harbor Lighthouse) and the Baileys Harbor Range Lights. You will also see a lot of scenic coastline and go by several shipwreck sites and may see one if conditions allow. A shorter Harbor Cruise is planned as well as sunset cruises. They will be running cruises from Baileys Harbor with the Water Taxi and Gills Rock with The Shoreline. 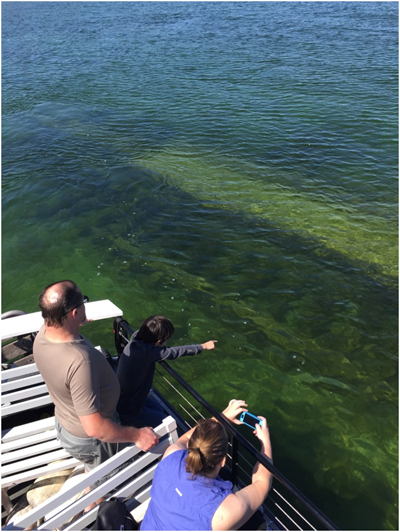 Shoreline Marina (Below Shoreline Restaurant and Motel)"
In 2015, there is an opportunity to see the wreck of The Grapeshot, which sank in 1867. It is rare to be able to get into these shallow waters to see it. So check it out, out of Gills Rock. See picture below. You will also see the over 100 year old historic Plum Island Coast Guard Station. Talk about nautical history, this cruise is loaded with it. On top of all that you will go over the site of several shipwrecks including three just at Pilot Island. "The Shoreline" is also used as Dive Boat so you will be able to see the outlines of some of the wrecks on their Hummingbird Side Scan unit. Very cool. You will also see the coastline of Detroit and Washington Island on this cruise and some interesting caves on the way back to Gills Rock. Aside from the Death’s Door Lighthouse Cruise they offer a Bay To Lake Cruise that covers the entire Nor th Coast of Door County from Death’s Door Bluff on the Green Bay side to Northport on the Lake Michigan side. Aside from more towering cliffs and caves and neat houses you will see the Islands mentioned in the above Death’s Door Cruise from a distance and, if conditions allow, your Captain will position the boat directly over the hull of The Fleetwing which sank in 1888 and you will be able to see parts of the ship underwater from the boat. Also departing from Gills Rock is an optional private Sunset/Lighthouse Cruise that circles Plum Island where you can enjoy the sights there as well as enjoy a patented Door County sunset from the water. Spectacular. Staying on Washington Island and want to take one of these cruises? Shoreline Charters can pick you up on the Island for a private charter either for a Deaths Door Lighthouse and Shipwreck Cruise or a tour up and around the north side of Washington Island or even Rock Island. See their website under the Gills Rock location for private charter information. Have your own group and destination in mind? 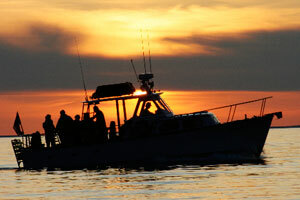 Shoreline Charters/Scenic Cruises has the boats to get you there for a personal private charter. 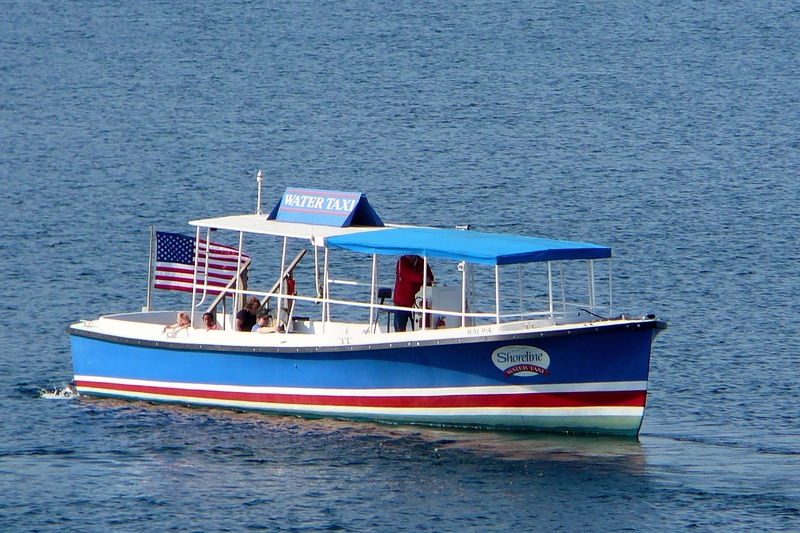 For larger groups from Baileys Harbor the Water Taxi can accommodate up to 42 passengers with plenty of seating and a large table. They work with area caterers or your favorite restaurant for snacks, beverages, and food - or you can bring your own. If you have a little smaller group, the 16 passenger "The Shoreline" is available from Gills Rock, Sister Bay, or Washington Island. Have boat will travel! "The Shoreline" is also available for specialty cruises such as the "Out Island Adventure Cruise" that takes you into the waters of Upper Michigan and includes 6 lighthouses and 8 islands or an overnight trip to Escanaba, Michigan for a casino trip. You can book a private charter for an hour, or a whole day! Call Captain Jim! 1. “The narrator was a wealth of knowledge on the area and history". 2. "We have been coming to Door County for years and this is the best thing we have done". We know you will enjoy your scenic cruise or private charters aboard Shoreline Charters/Scenic Cruises! So check out their website for additional information and when you book your cruise please tell Captain Jim that the crew at DoorCountyNavigator.com sent you, and you will save $3.00 off your excursion. Please tell them DoorCountyNavigator.com sent you - that helps keep this site alive and well for you - thank you.